If one of your friends or a family member called you from Jail would you know how to help them? Fortunately, the Santa Ana bail bondsmen at Mr. Nice Guy Bail Bonds do know the answers to those questions and many more. When you dial 844-400-BAIL, your call will be answered by a licensed Santa Ana bail bonds agent, not an answering service. You can now also Bail online using your computer or mobile device you are on right now, without having to leave home. No need to print, scan or fax! What to Do as Soon as Someone is Arrested in Santa Ana? Call 844-400-BAIL or 949-445-3420 to speak with a licensed Santa Ana bail bonds agent regarding the bail being posted to release your friend or family member. The sooner you call us, the sooner they can be released from jail. The professional bail bonds Santa Ana agents can get all of the paperwork completed before the arrested person even gets to booking to make the process as quick and easy as possible. When a person calls you from jail after being arrested, be certain to ask which jail location they are in, the correct spelling of the person's name and birthdate. Also, ask for the booking number if they have it and what the charges are for and bail amounts if known. This information can save a little time but. not worry if you do not have all the information. We can locate most persons in custody quickly using only the person's full name. At Mr. Nice Guy Bail Bonds Santa Ana reuniting friends and loved ones is what they do every day. Our friendly staff is happy to answer all questions you have regarding bail. We operate at the lowest authorized premium rates in Santa Ana and the whole California. We only write bonds with the largest and most ﬁscally sound surety companies. No bail to big. no bail to small. Mr. Nice Guy Bail Bonds Inc. is happy to handle all Bail Bonds in Santa Ana and the whole California. Need to get out of jail quick. Call us today! Family owned and operated. Local and National Service available. Santa Ana Bail Bondsmen Will Make the Bail Process Fast and Easy! Bail Online Without Having to Leave Home. No Need to Print, Scan or Fax! 24/7 Mobile Bail Service Available! What to know once someone has been arrested? The arrest process can take several hours depending on the location, arresting agency and time of day. Typically, once a person is arrested they will be brought into the police or sheriff station and booked. The booking process generally consists of being searched, any personal property being cataloged and fingerprinted. The person’s fingerprints will be put into a computer system that checks for warrants and pending criminal charges. The fingerprints can take anywhere from 30 minutes to several hours to come back. After the fingerprint reports are confirmed, a bail amount will be set and bail can be posted. 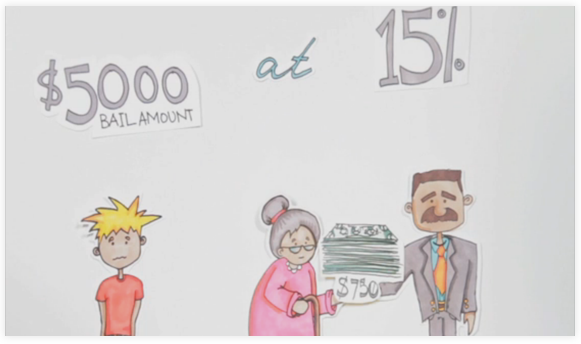 The Bail amounts set by courts are often far too expensive for most people to afford. By hiring a bail bonds company you can pay a small fee called a “premium” and have the bail agent post the entire bail amount. In addition, by using a bail bond the process of bail being posted and the person being released is much easier, faster and less complicated than trying to post the bond on your own. In addition, if a bond is not posted the person will have to stay in jail until the case has been resolved which can often take months, sometimes years. Allowing a person to post bond and be released from jail means they can go back to their families, jobs and take care of their obligations. Mr. Nice Guy Bail Bonds Inc. is a family owned and operated business. All of our employees are professional, friendly, reliable and discrete with all customer information. We do not sell, rent or share information with law enforcement agency. We work for you! It is our job to get you out of jail, we take confidentially very seriously. Your local Santa Ana Bail Bonds agents are trusted by many Californian's. Bail online using your computer or mobile device you are on right now, without having to leave home. No need to print, scan or fax! Cheap Rates - We offer the lowest rates with all costs upfront, no hidden fees. Quickest Service– We have bail bondsmen standing by at our office and mobile to meet you at the jail, home or office anytime day or night. Trusted Bail Agency– Most recommended bail agency by the top criminal defense attorneys in Santa Ana & the whole Southern California. 24/7 Service to All Jails and Courts. Who is the bail bond company? Mr. Nice Guy Bail Bonds Inc. was established by an industry professional whom holds several advanced social science degrees and continues to teach at local universities. Our goal is to provide clients with an honest, smooth experience. We pride ourselves in creating safe, respectable service that one wouldn't hesitate to refer their sisters and mothers to if needed. If you are a client of media interest, we have no interest of taking advantage of your status; we are trustworthy, discrete, and dependable and hold ourselves to the utmost of confidentiality. Our Santa Ana bail bonds office is our main location in California. What is the bail bond agencies experience? We have many years of experience in the bail industry and have helped thousands of clients get out of jail. We specialize in PC 1275 bail hearings, bail reduction services, and large bail amounts. Even if you have been turned away from other bail bonds companies for lack of collateral, bad credit, no credit or low down payments, give us call now! We write bonds that most bail companies turn down. 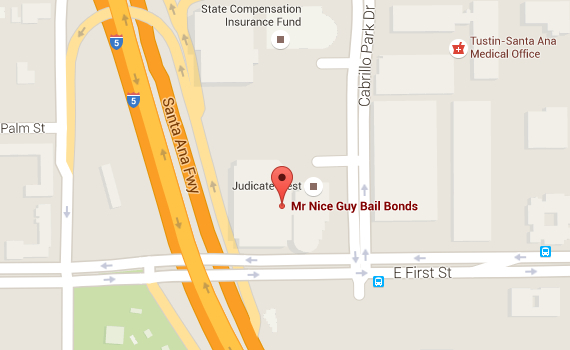 Mr. Nice Guy Bail Bonds Santa Ana specializes in unique situation bail and welcomes it. We provide fast approvals and bail quick postings. Free bail information and free warrant searches. 24/7 Service to all jails and courts. Payment plans with no finance fees. And bail online! 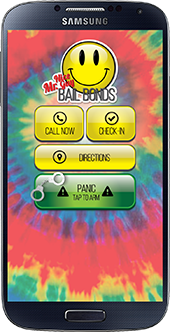 Mr Nice Guy Bail Bonds has become the industry leader in doing bail bonds that other bail companies usually turn away. Get in touch with our reliable Santa Ana bail bonds agents today! Honesty, professionalism, combined with knowledgeable and friendly service. Things to look out for in our industry. Hidden costs: renewal fees, reinstatement fees, late payment fees and interest. Many unscrupulous bail bonds companies hide hidden fees in the fine print. For example, many bail bondsmen are charging annual bail premiums, a yearly charge of the entire bail amount. In addition to interest financing fees, late file fees and reinstatement fees. These “fees” can often result in a person being forced to pay double or triple the bail amount over the course of a year or two. Don’t get charged twice or more call Mr Nice Guy Bail Bonds today! We do not charge any hidden fees, no annual premiums, no interest financing. Get in touch with our reliable Santa Ana bail bonds agents today! Call Mr Nice Guy Bail Bonds immediately and try to have the person’s full legal name and date of birth ready. Pricing - How much does bail cost? California sets the bail premium at 10% of the bail amount; however discounts are available for active military, those with a private attorney and certain other cases. For example, if the bail amount is $25,000, the bail premium (the amount you would pay) is only $2,500. The lowest legally allowed is 7% with certain restrictions; please contact us to see if you qualify for any discounts. Federal bonds and immigration bonds cost between 15-20% of the bail amount and typically require full collateral. Different types of bonds do you offer? We offer bail bonds throughout the state of California for all types of bail amounts, crimes and charges. We can also help with out of state bonds in certain instances, please call us today to learn more! After being arrested, the person will be taken to a jail or policestation. After arriving at the police station or sheriff’s intake facility, law enforcement officers will take finger prints, photos (mug shots), inventory personal property (wallet, IDs, phone etc.) and enter the persons information into the state and federal databases. After all of this information is entered, the bail amount and court date will be assigned. What happens after release of bond? After being released on bond, the person should contact the bail bonds company to verify important information such as court date(s), court location, charges, and any other information the bail bonds company may need to communicate. How does a customer benefit from hiring our company? The benefits of hiring our bail bonds company are numerous and include the following: fast, friendly, professional service with the lowest prices. We also offer the flexibility of being able to post bail online using your computer or mobile device. In addition, when you call Mr. Nice Guy Bail Bonds you will be connected to a licensed bail bondsman or bondswoman, not an answering service. Get in touch with our trusted Santa Ana bail bondsman today!